This computer was rescued from the roadside where it was dumped, still in working condition. 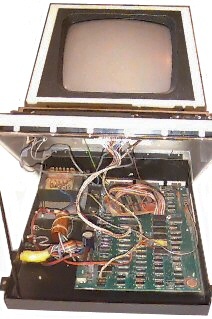 It has had it's memory upgraded from 16 to 32Kbytes and its display can now be switched between 25x40 and 25x80 mode. Three keys, escape, tab and repeat have also been added which effectively makes this machine the equivalent of a Commodore PET 8032 (AFAIK).